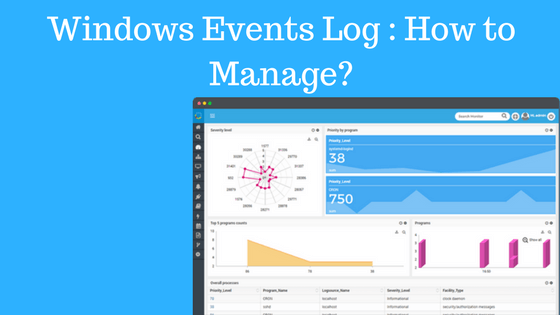 Windows Event Log – How to Manage Them? Windows event logs hold loads of information in them. We need to access the right set of information at our disposal without having to study the entire event log through a log management software. It will only be beneficial to us if we know how to manage windows event log efficiently. Windows event log contains event such as completion of the successful task, errors messages, and failure of an event such as entering incorrect credentials. All these logs have IDs associated with them and can be easily identified as well as sent to security audit. Windows stores various event logs like windows log that includes information about the changes in the system, devices, device drivers, applications that are installed on the system, security logs, services logs that are running on the system, setup logs and forwarded logs that are collected from remote systems. These logs can be accessed by event viewer located under the administrative tools. Windows allows you to study each log in depth. It tells you the number of events occurred for that particular log. You may find tons of data and impossible to go through each one of them. In order to ease your painstaking to scan each log, windows let you create custom views and manage the logs. Prioritize the ones you want to view and add it to the custom view. You may also assign a task to specific logs that deem fit and have necessary control if not complete control over the log files. These can be best utilized if you want to filter a particular type of error. You may include the list of computers that are displayed and want to include them in your filter. Managing all logs is not an easy profession, as stated above you may want to custom view, pick the ones you need the most and use filters wherever necessary. These steps will help you get to the required data that maximizes the utility of the logs that your server generates 24X7. If you are new to creating custom views, you should begin with laying out the data you need to access and then understand the IDs that are associated with them. These IDs will help you trace and monitor the events separately. If you are unfamiliar with the error, check the event properties, locate the Event ID and look for the information online to dig deep into the problem and the possible solutions. Tracking user activity is one of the prominent features in event logs when it comes to auditing security concerns. It is important to configure audit policies on workstations and servers and if need be administrators thoughtfully must create events and may test it out prior to implementation. Domain administrators create events to monitor unauthorized activity at the first occurrence. For certain activities alert is created when the accumulation of events crosses the threshold limit. Example of such activity is like attempting to log on by guessing the password. This results in a collection of events, as the user tried multiple attempts to crack into the system. After analyzing an event you may schedule a task that requires immediate attention. The task to send an email to devise failure, or connections failure or FTP disconnection can be scheduled to alert the administrators. These alert emails help maintain the server performance efficiently. Overwrite: When you choose to overwrite, each new event gets stored replacing the oldest event. Archive: No event is overwritten. All the events are stored safely and the log is automatically archived and moved to a safe place when it reaches the maximum log size. Do not overwrite events: This option is selected when you want to manually clear the logs rather than automatically. Logs tell you ‘who, what or why’ an event took place and helps the IT professionals while trying to look for answers for all those events that might have occurred with their infrastructure. A high-level critical event suggests that the event must be investigated immediately. Medium and low-level events suggest that they require the attention of the IT professional only if the number of occurrences significantly exceeds the threshold. It is also noted that every IT environment is different and only the IT experts can identify if the event stated as highly critical may be regarded as harmless events or not. It is entirely up to the IT administrators who are highly proficient in their domains to monitor and analyze potentially critical event IDs and make the IT infrastructure a safe working place. Motadata supports all categories of logs that are generated from different or multiple sources. It provides smooth solutions needed to handle the issues of today’s increasingly complex IT infrastructure management. Motadata platform enables IT administrators to have an in-depth access to all types of security insights and analytics, supporting with alerts on unusual changes as well as unauthorized access.